In these vignettes and short stories of Americana, there’s a fair share of leggy girls who like to go bee-bopping with an older teacher-type dude who often writes in second person present You. These inquisitive girls from the Mississippi Gulf Coast climb into Your car and ride You around even if You’re driving. The law of averages says You’ll have marvelous fun with some of them, and some will leave You flat or puzzled. And for readers, I think that holds true for this collection of stories too. I don’t know how old these pieces are. His fine novel “Tracer” (also reported on, as well as “Elroy Nights”) still reverberates in my brain and I don’t see the others in the same sort of admiring light. I read this story collection as an historical perspective, like stuff developed en route to where the author is now, and maybe that was wrong on my part. I’m one of those readers who groans at first when reading a piece either in present tense and/or in “You” voice. It’s so precious and like 2003-workshoppish. At least Barthelme, an old pro, can carry it off with skill and dignity. Few can. We’ve moved on, though – right? 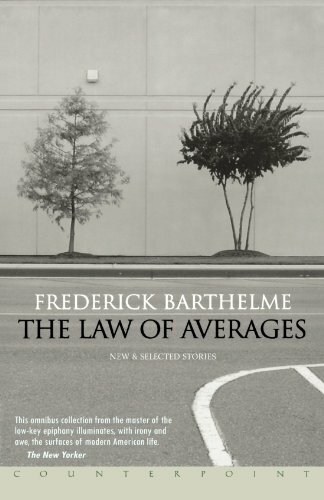 Posted in booknotes and tagged Frederick Barthelme book review on August 24, 2013 by Wm P.